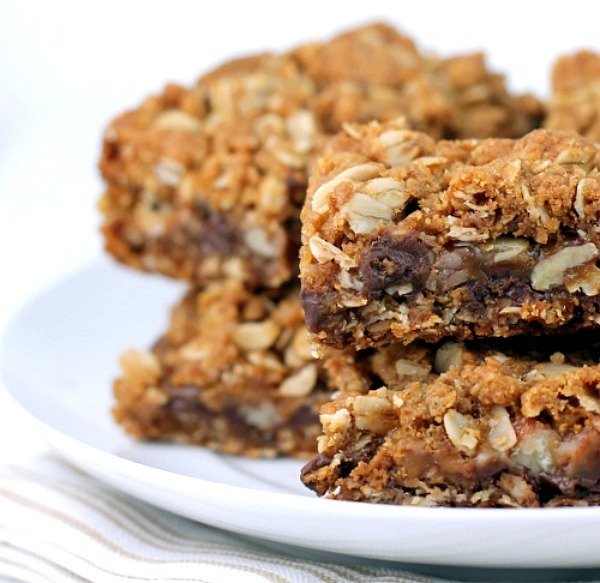 Buttery oats, chocolate chips, caramel and pecans come together perfectly in these delicious bars. Oatmeal Chocolate Caramel Bars would be the perfect treat to make for Graduation parties, Mother’s Day and your summer celebrations. Chewy, chocolaty, caramel treats your family will love! Preheat oven to 350 degrees. Grease a 9×13 inch baking pan with shortening. Unwrap caramels and place in a medium size heavy duty sauce pan along with the milk. On low heat, stir the caramels and milk until smooth, remove from heat. Set aside. In a large bowl stir the flour, oats,brown sugar,baking soda, salt and egg. Cut the butter into the flour mixture with a fork until crumbly. Press half the mixture into the bottom of prepared 13×9 inch baking pan. Bake for 10 minutes. Sprinkle the chocolate chips and pecans over the baked layer. Drizzle with melted caramels. If the caramels have cooled off , reheat just enough to be able to drizzle. Evenly sprinkle the remaining crumb mixture over top. Bake 20 – 25 minutes or until golden brown. Cool 30 minutes. Loosen the edges of the bars from the pan by running a knife around the edges. Cool completely. Cut into bars. I love just about anything with oatmeal – add the chocolate and carmel – I’m sold! Pinning. Thank you for sharing your talents with us at the Brag About It link party! Oh yum! We will be making these for sure! These sound yummy! & look delicious! Hope I get a chance to make your recipe. These bars looks so irresistible! Thanks for linking up with What’s Cookin’ Wednesday! These bars look yummy. I love anything that has oatmeal in it. Thank you for linking up this week on the #HomeMattersParty looking forward to seeing what you link up next week.